for our Media + Marketing Summit Melbourne, taking place 25 July at Southbank's The Arts Centre. Names confirmed for Melbourne's spectacular include Dr Katie Spearritt, TV bosses Luke Smith (Channel Seven), Michael Stephenson (Channel Nine) and MCN’s Mark Frain, as well as NAB general manager, Brand Experience, Michael Nearhos, Gayle While - Clemenger Melbourne Deputy CEO, James McGrath - Clemenger Creative Chairman, World Vision CMO Terera Sperti, Havas MD Matt Houltham, Deloitte Digital’s Simon Stefanoff, Zenith CEO Nickie Scriven, Media Math’s Emil Mathias, Women’s Digital Network co-founder Angela Mellak, Jules Lund and many, many more. The full day event in Sydney last month garnered great feedback with stories such as how dwindling CMO tenure is killing consistency, how Cricket Australia is shifting perceptions from a ‘gentleman’s game’ - as well as a look at how Australia will roll out 'world leading' addressable TV solutions this year and how addressable advertising will “prevent further haemorrhaging” of TV into digital. As well as a session on meditation and a blockchain 101, a heated panel on consultancies also discussed how some agencies need to do a much better job at marketing themselves. Sessions include: keynote speaker, Dr Katie Spearritt; the Promise of Addressability (in association with ThinkTV); One brand and agency’s part of the $45bn unfinished journey: Havas and World Vision; How AI is on the brink of revolutionising media, marketing and advertising (in association with Deloitte Digital); Beyondmetoo - Why safe, harmonious, and fully inclusive workplaces are key to driving successful businesses; and Making the marriage between client and agency work with Clems and NAB. We are also thrilled that last year’s Presenting Partner Carat will resume its role with us. Supporting AdNews helps us provide awesome content and allows us to address industry issues and hot topics that need zoning in on - so a big thanks to all that are supporting us with this flagship AdNews event. Two extra special sessions, set to be delivered by Facebook and Bauer, will be announced nearer the time. Our partners will also deliver short, sharp presentations on where their side of the business is headed in the next 12 months. Think TV will scope out the television landscape; ARN will deliver on the future of the radio business; NewsMediaWorks will refresh us on the developments in print and Amobee will take on digital. Early Bird discounted tickets are available now. Dr Katie Spearritt is chief executive officer of Diversity Partners, a specialist consultancy that helps companies to achieve diversity progress and create more inclusive and high performing work environments. After two decades in leadership roles in Australian and global firms (Hewlett Packard, Coles Group, NAB), Katie founded Diversity Partners in 2009 as a strategic partner to organisations wanting to . Since then, Diversity Partners has worked with more than 200 organisations, including many top ASX firms and a range of media, legal and sporting organisations. Already some 10 years in the making, media agency bosses predict that 2018 will be the year of addressability – and given this event falls half way through the year, this session is primed to deliver some of the first results from the market’s early forays into the new media environment. This strand will bring together senior execs from all major TV networks to explore the successes and, potentially, some of the teething issues surrounding our new ability to deliver hyper-targeted, curated campaigns to Australia’s TV viewers. Despite massive upheaval in our industry – from podcasting to programmatic, digital transformation has barely begun, with a recent study showing that it will contribute $45bn to Australia’s GDP by 2021. In three years’ time, the media, marketing and advertising landscape will have significantly recalibrated once again. We will hear from Havas Melbourne MD Matt Houltham and World Vision CMO Teresa Sperti about how they played catch-up and now in 2018, how they are primed to embrace the next three years of transformation. How AI is on the brink of revolutionising media, marketing and advertising. This session will deliver a detailed look into what will be required of marketers, agencies, brands, copywriters and everyone in between as we face a future that is driven by AI and voice. After turning the audience into the creative at our Sydney Summit, Tribe founder Jules Lund is back to show Melbourne how it's done. In his inimitable and entertaining style, Jules will delve into a vision where consumers will be able to supply the creative for multi-channel brand campaigns by simply pulling their devices from their pockets – and with the help of our audience, he will show how this can happen. He will also reveal why this is set to transform the advertising industry in less than a decade, partly driven by the ascension of millennials to the c-suite. The partnership between a marketer and an agency is much like a marriage, and relies, among many things, on trust. In such times when trust has been eroded, how does the partnership work? We will host an exclusive conversation between Gayle While - Clemenger Melbourne Deputy CEO, James McGrath - Clemenger Creative Chairman and Michael Nearhos - General Manager, Brand Experience, NAB. Our partners will also deliver short, sharp presentations on where their side of the business is headed in the next 12 months. Think TV will scope out the television landscape; ARN will deliver on the future of the radio business; NewsMediaWorks will refresh us on the developments in print and Amobee will take on the mighty digital world. 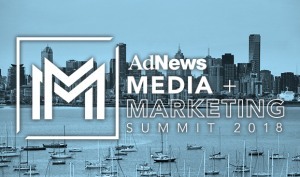 Hot off the heels of our successful Sydney event, AdNews is delighted to unveil the full program for our Media + Marketing Summit Melbourne, taking place 25 July at Southbank's The Arts Centre.